Fujifilm X-Pro2, 50mm, 1/150 @ f10, ISO 200. There are many things I have thought about photographing, a sort of bucket list of subjects. This list is not written down and if you asked me to name the subjects, I'd probably struggle a bit and surely would miss a few. Sometimes that's because I don't even know something is on my list until it's right in front of me. Like when I was in Fairbanks, Alaska, a few years back and realized I might have the opportunity to see the Northen Lights. Suddenly that was on my list and after three late night attempts, I was rewarded. Shortly after arriving at Thule, Air Force Base in Greenland, I noticed icebergs and suddenly photographing them was at the top of my list. Fujifilm X-Pro2, 50mm, 1/160 @ f11, ISO 200. Thule AFB is the northernmost U.S. military installation, located 750 miles north of the Arctic Circle and 947 miles from the North Pole on the northwest side of the island of Greenland. I was on assignment to photograph the deployment of oceanographic buoys over the North Pole. Cool assignment, right? However, since I had several days until the aircraft from which we would drop the buoys from arrived, I had plenty of time to explore and photograph the incredible landscape located all around the base. Fujifilm X-Pro2, 16mm, 1/480 @ f5.6, ISO 200. 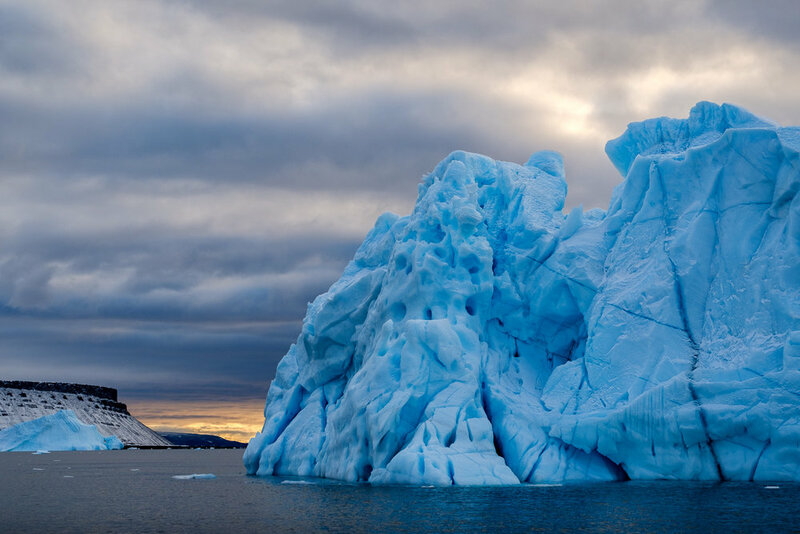 My first real view of the icebergs came while I was photographing Wolstenholme Fjord at sunset. I've photographed so many bodies of water, so many sunsets, and I've even photographed glaciers before. But what makes Wolstenholme Fjord unique is that it's fed by four large glaciers and that was the picture I was trying to make. But it was the icebergs floating throughout the fjord that I found most interesting. I also began to wonder if there was a way to get closer. Fujifilm X-Pro2, 50mm, 1/340 @ f8, ISO 200. What I didn't appreciate at the time, photographing from high above the fjord, was just how big those icebergs actually were. When I finally had an opportunity to get close to them, it just blew me away. Once I started taking pictures, I no longer felt the cold, didn't hear the voices of the others in the 15-foot skiff or care that it was almost seven o'clock at night and I hadn't eaten dinner. 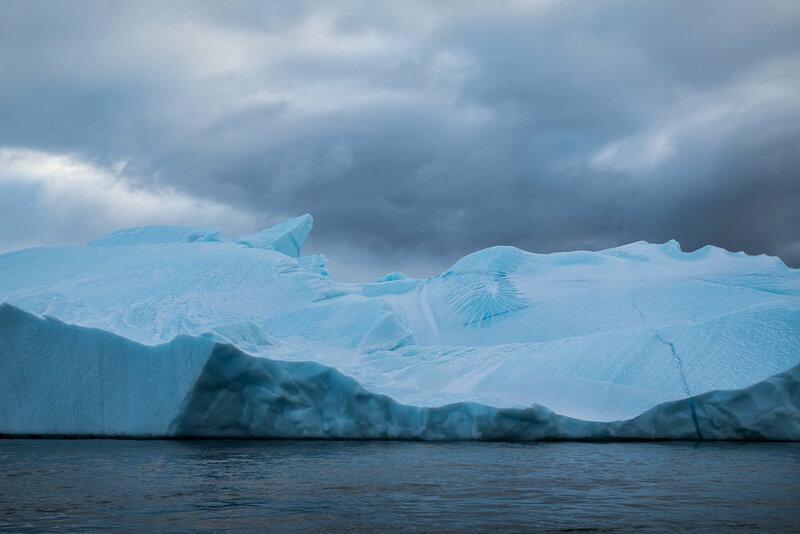 I was focused on icebergs, shooting, changing between the Fujifilm XF 16mm (24mm full-frame equivalent) f/1.4 and the Fujifilm XF 50mm (70mm full-frame equivalent) f/2 lenses, and shooting some more. Fujifilm X-Pro2, 16mm, 1/210 @ f11, ISO 200. As we approached each iceberg I began to realize how different each one was. From a distance, they all look pretty much the same, but seeing them from sea level, up close, you appreciate that each one is unique in shape, size, and color. 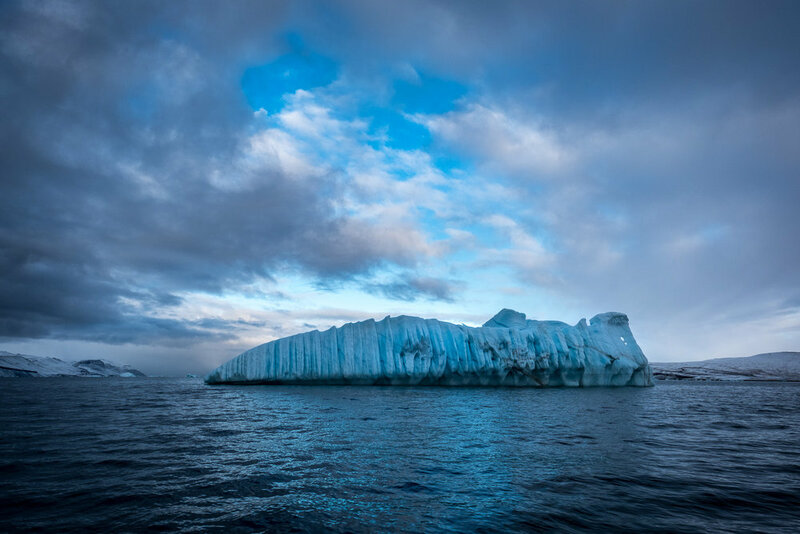 As we neared each iceberg I would begin taking photographs and just when I thought I took every photograph possible and lower the camera, something would change and I would find myself shooting again. Fujifilm X-Pro2, 50mm, 1/500 @ f5.6, ISO 200. The icebergs actually seem to change color as you move around them. Going from white to blue, and all shades in between. From a distance, they had a monochromatic look, but up close it was evident they were anything but. To make it even better, the sun setting (something that seems to last forever at this time of year in Greenland) and the clouds hung in the sky and provided a nice contrast to the icebergs. Fujifilm X-Pro2, 16mm, 1/680 @ f5.6, ISO 200. 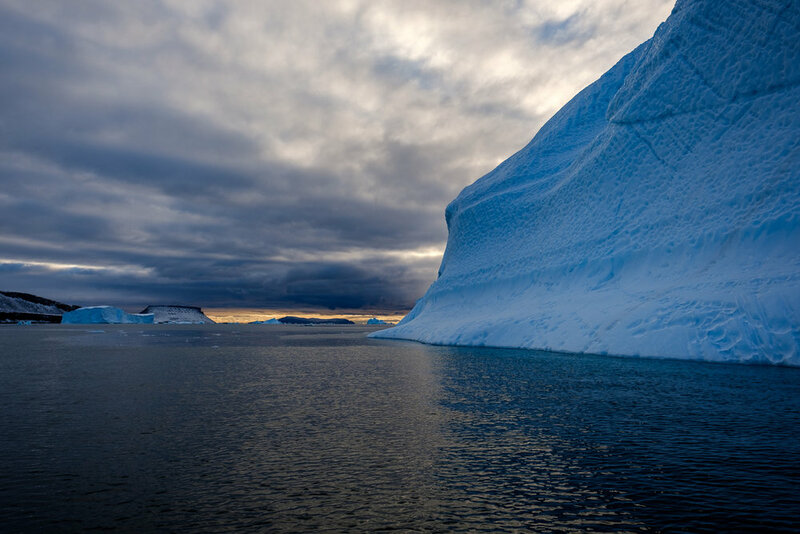 In total, I had a little over an hour to photograph as we moved from iceberg to iceberg. I could have spent two hours capturing more icebergs or probably spent the whole hour on just one iceberg.